He died like he lived. This entry was posted on Sunday, September 3rd, 2006 at 10:11 pm and is filed under Uncategorized. You can follow any responses to this entry through the RSS 2.0 feed. You can leave a response, or trackback from your own site. just heard the news..damn man..
I’m thinking of a word right now. It rhymes with roucherag. Can you guess what it is? Wow, this is the first I’ve heard of it. I guess “The Simpsons” is nearly prophetic. “Gator Baiter” indeed. In West Australia, born and raised. In the ocean, that’s where I spent most of my days. stroking some stingrays inside the pool. started making trouble in Australia Zoo. the licence plate said fresh and had dice in the mirror. but I said man forget it, yo captain to Bel Air. and I yelled to the captain yo holmes smell ya later. he had beaten me there. CRIKoh godammit I was beat to it. I must admit, despite his occupation, it surprised me to hear of his death. 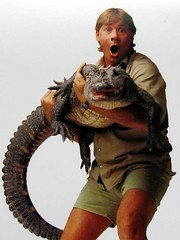 CRIKEY MATE, SHE’S A BEAUTE!!! If there is an afterlife, I would wish him one of adventure.. If there is not he will live on in the collective pop culture and in the memories of his families and friends. Personally I liked the show.